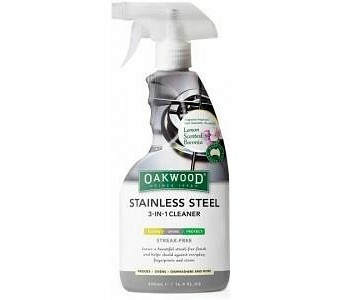 Specially formulated as a complete treatment for household stainless steel surfaces, Oakwood’s Stainless Steel 3-In-1 Cleaner simultaneously dissolves dirt and grime, polishes to a streak-free shine, and deposits a thin, invisible protective film that remains in place to protect the metal from fingerprints, water spots, grease smears and other staining agents. Especially appreciated in the kitchen, where it keeps sinks, cooktops, hoods and more looking cleaner and brighter longer. The fresh lemon/lemongrass scent of Tasmanian Boronia makes it a pleasure to use. This is the lowest price seen on this item at Petstock in the last 6 months!